half shaven, still half dressed in foam. exactly at the midpoint of her life. Author bio: Anna is the Programme Director in the English Department at Victoria University. She has published five poetry collections, including Thicket, which was shortlisted for the New Zealand Post Book Awards in 2011. Her latest collection I, Clodia, and Other Portraits was published by Auckland University Press in 2014 (my review here). Anna is currently organising a Ruapehu Writer’s Festival with Helen Rickerby to be held in Ohakune, March 2016 (Facebook page here). Paula’s note: This surprising poem, holds narrative in its palm, a sharp moment that reverberates with implication. I get to the end and I am pulled back to the beginning, again and again. The musical chord that holds the moment together (and thus the poem) jars, unsettles — until that moment of silence and it feels like time has iced over. Within that silent beat, poetry blooms. Ha! I need to get to work but this poem keeps distracting me. I adore the power of poetry to do just that. This entry was posted in NZ author, NZ poetry, NZ poetry, NZ Poets, Poetry and tagged Anna Jackson, POem Friday on October 30, 2015 by Paula Green. of crowds in the street. Author Bio: Carolyn McCurdie is a Dunedin writer. She won the Lilian Ida Smith Award in 1998 for short stories and a collection of stories — Albatross was published in 2014 by e-book publisher Rosa Mira Books. A children’s novel, The Unquiet, was published in 2006 by Longacre Press. She was the winner of the 2013 NZ Poetry Society International Poetry Competition and her first poetry collection, Bones in the Octagon, was published in 2015 by Mākaro Press as part of their Hoopla series. Carolyn is active in Dunedin’s live poetry scene, where she is a member of the Octagon Poets Collective. Paula’s note: The potato is comfort food, but this particular potato hooks you to the extended family table where the sun is blazing down and family stories circulate. Christmas. Ah. Reading the poem, each word gleams in the light bright space of the page along with the deep pit of personal memory. Each word is so perfectly placed for ear and eye. This is the first poem I read in Carolyn’s debut collection (the title lured me in — especially the idea of a sonnet meeting up with potatoes). There is a quietness, an attentiveness, delicious overlaps of meaning and propulsion. I can’t wait to settle back into the book and discover more. This entry was posted in NZ author, NZ poetry, NZ poetry, NZ poetry book, NZ Poets, Poetry and tagged Carolyn McCurdie, Makaro Press, POem Friday on October 23, 2015 by Paula Green. Author Bio: Steven Toussaint is the author of The Bellfounder (The Cultural Society, 2015) and a chapbook Fiddlehead (Compound Press, 2014). He recently completed a Ph.D. at the International Institute of Modern Letters on 20th century American poetry and music. He lives in Auckland. NZ distributor is Time Out Bookstore. Note from Paula: This poem is like a talisman. I have always loved the way heart holds ear along with heat and art, and then stretches out, ever so slightly, to become hearth. A corner stone for poetry. 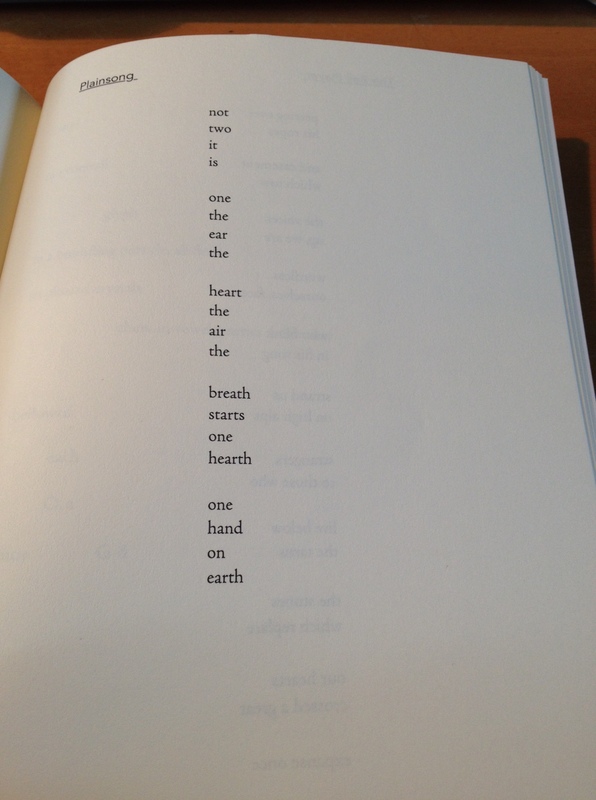 I photographed the poem in the book as whenever I post poems they insist on hugging the left-hand margin. This poem needs its white space in order for the melody to strike so beautifully. It is also one melody among many in a book resplendent with aural delight. This is the intriguing note on the poem: “‘Plainsong’ arpeggiates a chord by Ronald Johnson (‘Bean’ 24′).” I will talk about the book as a whole soon. This entry was posted in Uncategorized and tagged POem Friday, Steven Toussaint on October 16, 2015 by Paula Green. Did you get the moon? in your hoodie with your tripod. You laugh. Recall another evening. Nice to see the sky. Okay. True. it’s all there – or it’s not. The jug is heating up. the outer layer of my insistence. Author Bio: Murray Edmond was born in Hamilton in 1949. He has published thirteen books of poems. Letters and Paragraphs (1987) and Fool Moon (2005) were New Zealand Book Awards finalists. 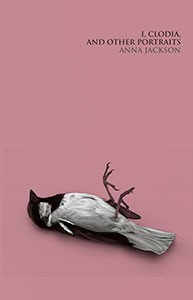 His latest volume of poems is Shaggy Magpie Songs (2015) from Auckland University Press. A collection of fiction, Strait Men and Other Tales, will be published by Steele Roberts in October 2015. His collection of critical writings, Then It Was Now Again: Selected Critical Writing was published by Atuanui Press in 2014. A study of Noh theatre and the Western avant-garde, Noh Business, was published by Atelos Press in California in 2005 and the long poem A Piece of Work was published by Tinfish Press in Hawai’i in 2002. He co-edited the anthology Big Smoke: New Zealand Poems 1960–1975 (AUP, 2000); and is the editor of the peer-reviewed, online journal of poetics Ka Mate Ka Ora: A New Zealand Journal of Poetry and Poetics. Since the 1970s, Edmond has been active in experimental and innovative theatre companies and for over 25 years taught theatre and drama at The University of Auckland, retiring from his position as Associate Professor of Drama at the end of 2014. He works as the dramaturge for Indian Ink Theatre Company, whose latest play, Kiss the Fish, was awarded Best New Play of 2014 in the Chapman Tripp Awards. Note from Paula: Reading a Murray Edmond poem is like entering a linguistic harbour – you are held by the sway and slip of words, the way that sharp sea air alerts your senses, rejuvenates skin and eye and ear. He is the master of word play but the coils and overlaps and skids never feel stuck in exercise mode. This word play is infectious. It nourishes the gap and supports the bridge. Beneath the surface there is always heart, and with that subterranean heart, these are poems that matter. Moons are a favoured motif in this collection and others. Mysterious; a drawcard in the pitch black of night or a poem or a myth or mood. The first line startles in its punning sidetracks (‘Did you get the moon?’). The last lines startling in their pitch for beauty. In between, gossamer threads that make silvery links between things. Luminous. Eye catching. In the heart of the poem, a relationship. And then another. A letter read. Under the skin; a poet, a lover perhaps. Like a boat under the milky moon you slip and sway upon the crest of the poem. It haunts. Lines stick like glue (‘I peel off/ the outer layer of my insistence’ ‘As if it were a/ landscape on the skin’). Do you get the poem? Jammed packed as it is with light and dark, everyday detail (Floorboards/ shaking’). The line that sends you between the lines (‘He writes/ about how it is impossible for/ anything to escape itself’). Get – arrivals. Glorious. This entry was posted in NZ author, NZ poetry, NZ poetry, NZ poetry book, NZ Poets, Poetry and tagged Auckland University Press, Murray edmond, POem Friday on October 9, 2015 by Paula Green. Poem Friday: Emma Neale’s ‘Origins’ … At the core, heart. like spider silk adrift on the air. across the corroding, rented roof. Originally printed in Landfall; appears also in Tender Machines (Otago University Press, 2015). Author bio: Emma Neale works as an editor. On alternate years, she runs a one-semester poetry workshop at the University of Otago. She has published five novels and five collections of poetry, the most recent of which is Tender Machines (Dunedin: OUP, 2015). Note from Paula: Usually in my Friday poem slot I have invited poets to write a note about their poem and I have added my own thoughts. Some poets are happy to provide sideways anecdotes or points of origin for their poems; others prefer to let the poems speak for themselves. I have no dogmatic stance on either option. Notes on poems can be utterly fascinating and provide unexpected roads into your reading. I don’t think they ever shut a poem down — as readers, when we press a poem’s start button, anything can happen. So I have decided to make the ‘note’ aspect of my Poem-Friday feature flexible – taken up on a case by case basis. This poem stalled me. It is the sort of poem I love to write about because it engages every part of my body — my eye, my ear, my heart and my mind. A poetry coup. Yet I wanted the poem to stand in its off-white space on the screen – shimmering, flickering on a cerebral and aural scale. Without my commentary. Intruding static. Yet I can’t help myself. Just a tad. I adore the loving craft of each line, the words and word connections that catch you by surprise, the surprise upheld like an internal beat, the way physical detail judders and then sets you off on memory tangents. At the core, heart. This poem is the first poem in the book. Read it, and then you can’t wait to devour the poems that follow. Within the next weeks I will post a review. This entry was posted in NZ author, NZ poetry, NZ poetry book, NZ Poets, Poetry and tagged Emma Neale, Otago University Press, POem Friday on September 25, 2015 by Paula Green.